We are continually plagued by internet problems this trip so that we are often out of touch or blocked from sending. I’m hoping this post will be able to go out today. The story of James continues with a listing of some of the strange and wonderful things that happened to him and that eventually led him back to us. We are telling you these things so you can see the same God we have seen at work here. The police turned James over to the organization Retrak (www.retrak.org) because they have the mission of reconnecting runaway children with their families. They received James in mid- to late January, so all the time we were praying and calling out to God, He had already answered our prayer about giving James an advocate to protect him and keep him safe. Every day until we heard that they had James on April 13, we would pray, “Lord, today would be a good day for James to come home.” The tenor of what we heard from God during all this time was quiet comfort and assurance, “I have him, he is Mine. He is safe.”Little did we understand this as we agonized and continually pushed our negative imaginations away. Every child that God sends to Retrak is taken to the doctor and evaluated. They discovered that James had two rotten teeth in the back of his mouth. He must have been in terrible pain. James was so frightened and unwilling for the dentist to treat him that they had to put him out, remove the teeth, then reawaken him. When he came back to himself, they told us that immediately he smiled because the pain was gone. They also took him to have his hearing evaluated, just as we had done. He saw a nurse in the speech and language department of the large government hospital in Kampala. They found that he did have some hearing, as we had discovered, but they were not as negative about his prognosis for future speech as the other people had been with us. The therapist had modeled some sounds to him, and he was able clearly to mimic some of her suggestions. In fact, we even caught him saying, clearly enough for us to understand him, “Hallelujah, Amen,” which is something Ugandans say frequently. Now I haven’t told you the interesting part of this. We attended Easter services at a large church in Jinja to see how the other half lives. 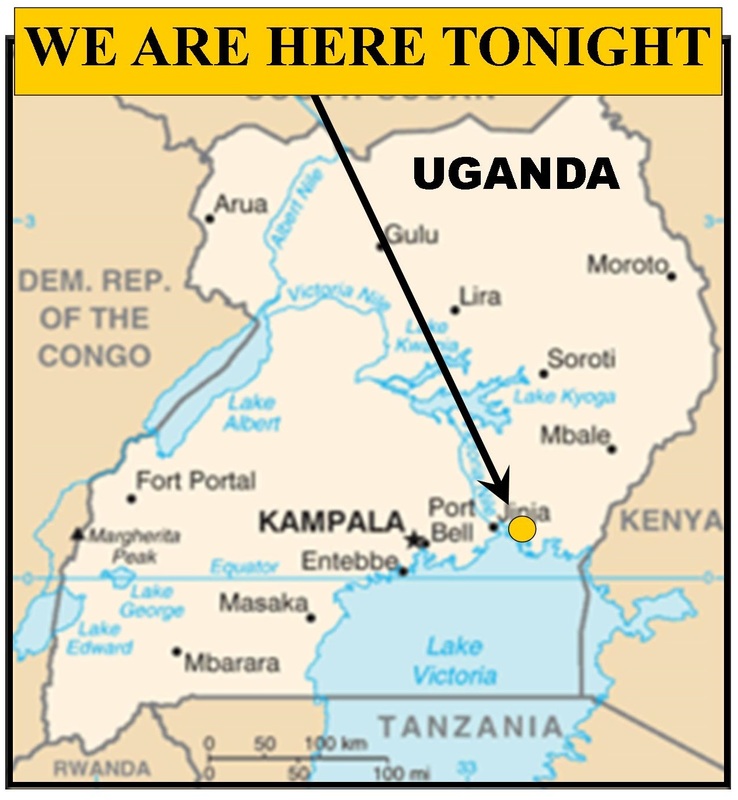 Surprise, for the first time ever we were served the Lord’s Supper in Uganda. Most churches are so small that they can’t afford to buy the elements for regular observance. 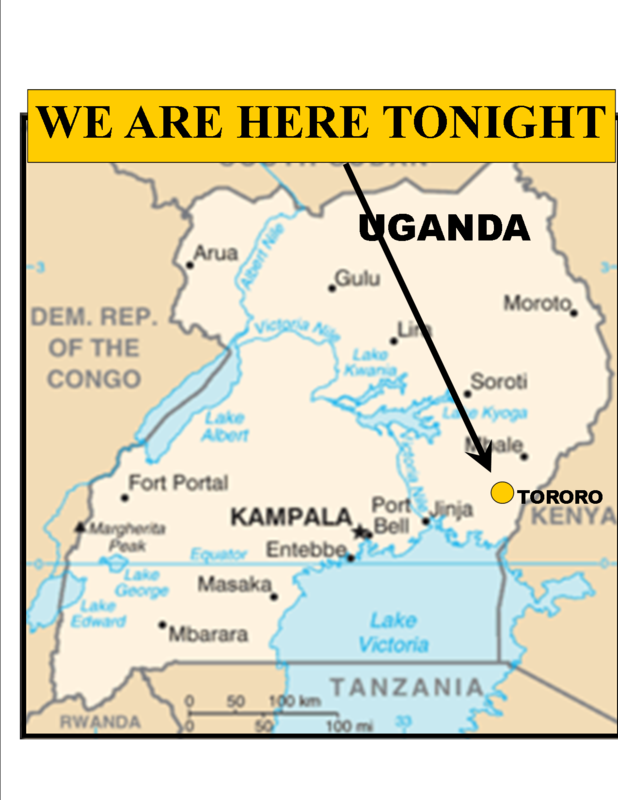 We had a wonderful worship time, then loaded the car for our next teaching point in Tororo. HAPPY RESURRECTION DAY! HE IS RISEN! 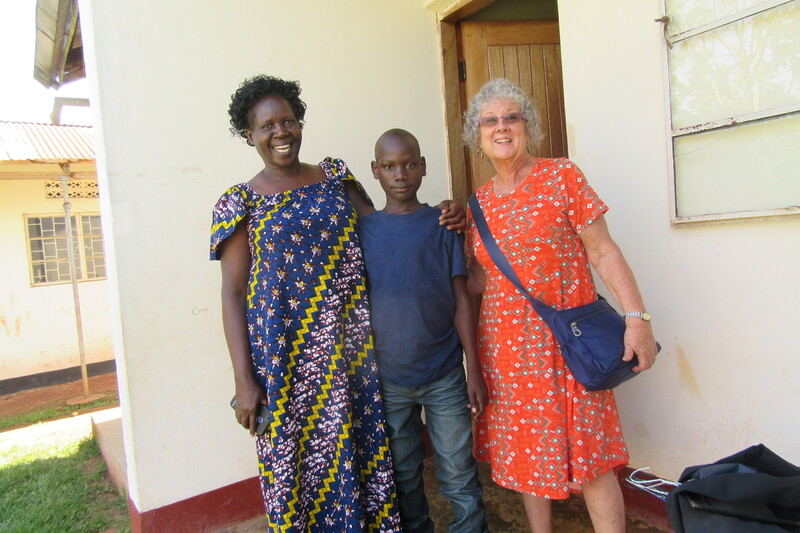 Thursday, after official business was finished, we made the round trip to Mbale and back to deliver James to school – about 4-5 hours driving. In our telling of the story of this small boy’s misadventures, there are many things which most readers can read between the lines. Some of these things will be guesswork, some experience with life, and some will be familiar themes from our own lives which we project onto this tale. I am choosing to leave them between the lines, to tell you the facts as I heard of them and then experienced them. I will leave you to your own conclusions as to why he runs, how he got so far from home, what God was accomplishing by literally herding his “freedom” down a specific and focused funnel into the arms of a powerful advocating organization that knows Uganda and its people and their cultural needs better than we do. When the police picked him off the street, they placed him legally into the custody of Retrak Uganda. This meant that Retrak could not release him to anyone else’s custody without legal authorizations from the ranking government officials in that area, which in this case included both Jinja and its suburb Bugembe. 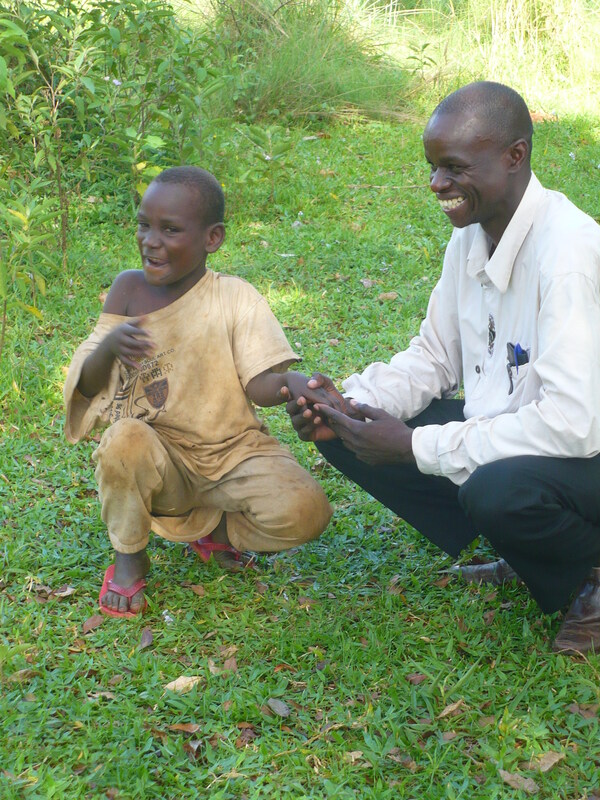 Alfred with James, the deaf boy, in the early days on Buvuma Island when we first met him. show them. We, Gail and I, and then separately Alfred, had to appear before certain officials, be interviewed even by Retrak to determine if we were suitable and safe for James, if James had a true relationship with us, etc. 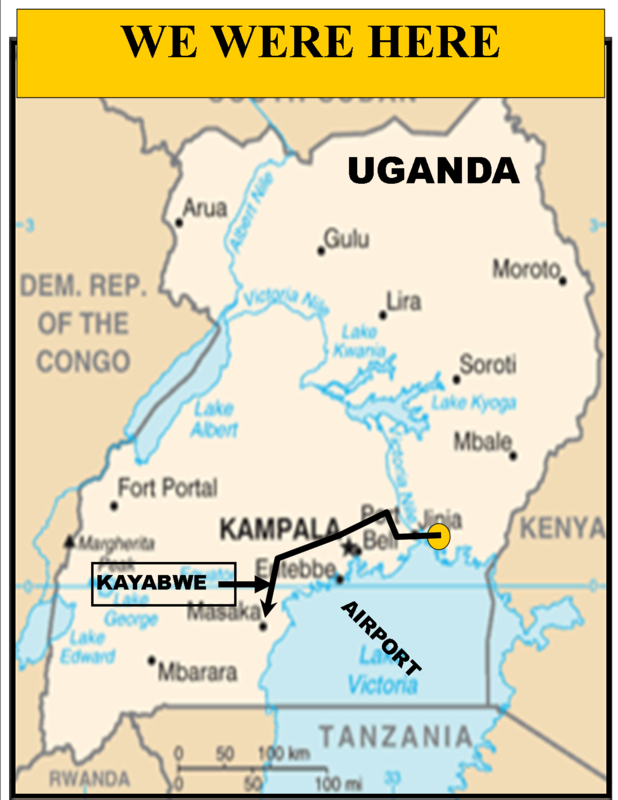 And even perhaps, James’ mother, who we now hear from Alfred and the uncles on the island, is not dead as we were originally told but remarried and living in Mbale, where James’ school is located (unverified). James is on two years probation for running away. One of the officials that we met with on Thursday was the Chief Probation Officer in Jinja who talked with all of us, the three personnel from Retrak, Alfred, who was required to fill out a multi-page form of personal information about who he is and what his relationship with James is, Gail and I briefly as part of the group, and James himself. 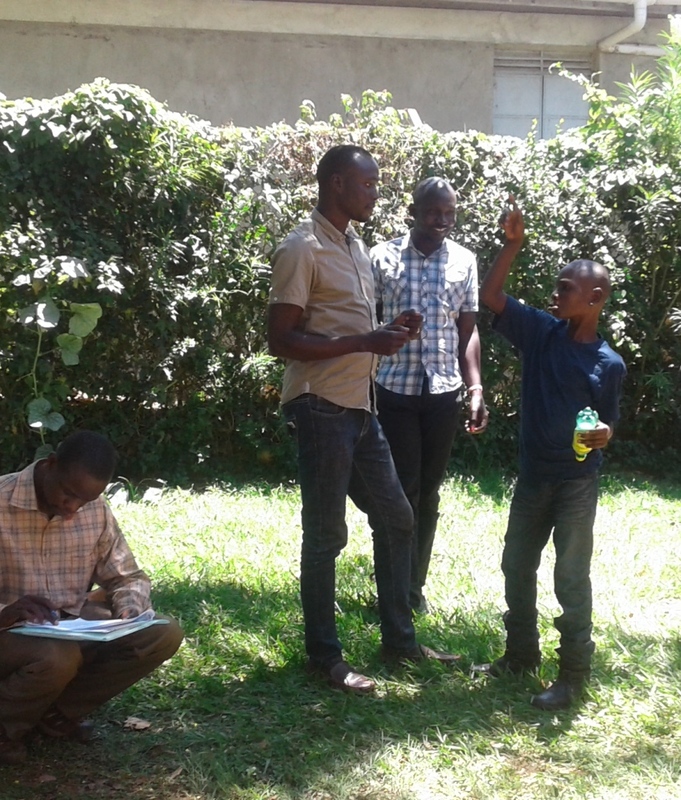 The officer, after interviewing us and reviewing the case, announced to the group that now, “James is mine!” Then he instructed Alfred that he would have to report monthly to him for two years on behalf of James. Because we had obligations in Kawango, a town way out in the bush about 150 km north of Jinja, to teach a group of leaders for the week (over 155 were in attendance), and because it was apparent that we would not simply be picking James up from Retrak on Monday, Alfred and I sadly made our way north without resolving the matter, while Gail went to minister with her friend Irene in Mukono (a suburb of Kampala), and we waited in anticipation all week long for the details to be ironed out. Finally, through many phone calls, it was agreed that Retrak, with James, would pick Gail up on Thursday and drive to meet us in Jinja, where they had appointments with the Probation Office in Jinja and later that day with the local magistrate in Bugembe, who had to stamp the papers before James could be released into our custody again. Friday was Good Friday, and so everything had to be finished by Thursday as offices were closed for the holiday on Friday. I informed my host that we had to cut the meeting short by one day in Kawango to take care of an emergency. The stage was now set – all that was required was patience and some endurance – it was a hard week with this reunion with James dangling over us. Everyone agreed that James should be immediately returned to the school on Thursday. Originally, Retrak had assigned one of their people to go with us and to begin the investigation of the school that very day. However, another child in their care was very sick back in Kampala and had to be transported to her home area hospital, so their personnel was scattered and their vehicles already in use for that emergency. We don’t much understand what all that was about, but it meant that we would be taking James back to school by ourselves, and it meant that God was whispering to us again through circumstances that He was in the middle of all this and that we could relax and trust Him – the place they were taking the sick child was far to the north, a place called Gulu (See https://meadeinternational.org/2018/05/22/ever-louder-whispers/). On Thursday, we converged from different directions on the parking lot of the Probation Department in Jinja. When the three Retrak employees emerged from the vehicle, I tried to greet them politely, but I only had eyes for James. I didn’t know how he was going to react to seeing me again after a year and all these escapades. When he saw me, I opened my arms, and he smiled joyfully and rushed to embrace me. We hugged and hugged as if there were no others standing witness. I learned later from the social worker from Retrak that this was a crucial moment for all of us – he needed to see that we were truly bonded to James and not just some well-meaning foreigners. 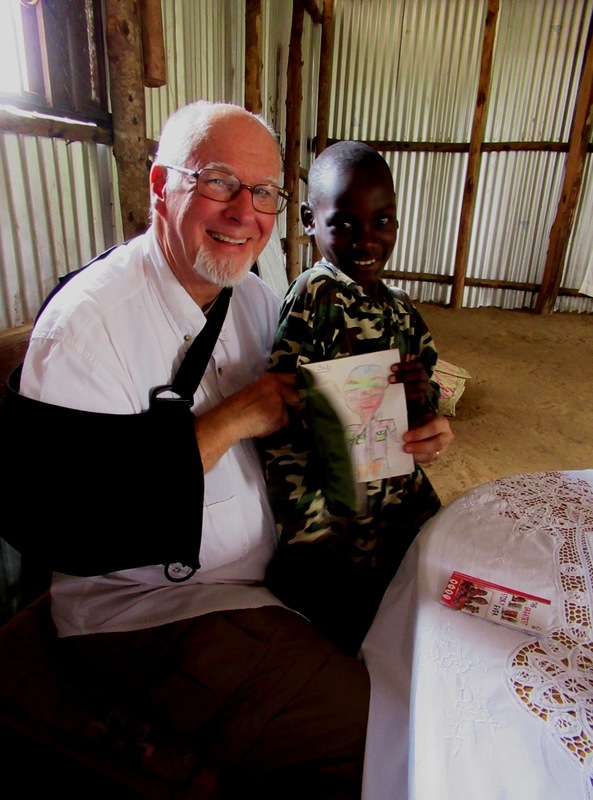 James’ hugs and my tears told the story to him, and he relaxed and knew that he was witnessing something real and amazing – it was for him perhaps one of the moments of restoration that they have dedicated their lives to achieve for these children. They told us that they had taken James to a deaf church to try and interview him to find out who he was and where he was from. James declared with not the slightest hesitation that his parents were white. They couldn’t believe him and chided him that this was impossible because his skin was black, but James never backed off – his parents were white! None of this made any sense to them until that moment in the parking lot. James’ white parents delivered James to school on Thursday where he is now safe and happy to be back home. We arrived back at our guesthouse late that night after one of the longest and sweetest days in our memory. Part 3 will finish the tale, filling in some of the significant details. Long story short so you don’t have to wait for the end of our telling of it: we have James, he is back in school, he is happy and well. The saga of James continues. After he ran away from Alfred’s home where he was staying for the two month school holiday in December and January, it seemed the earth had swallowed him. Alfred had many leads, but always to other deaf boys. 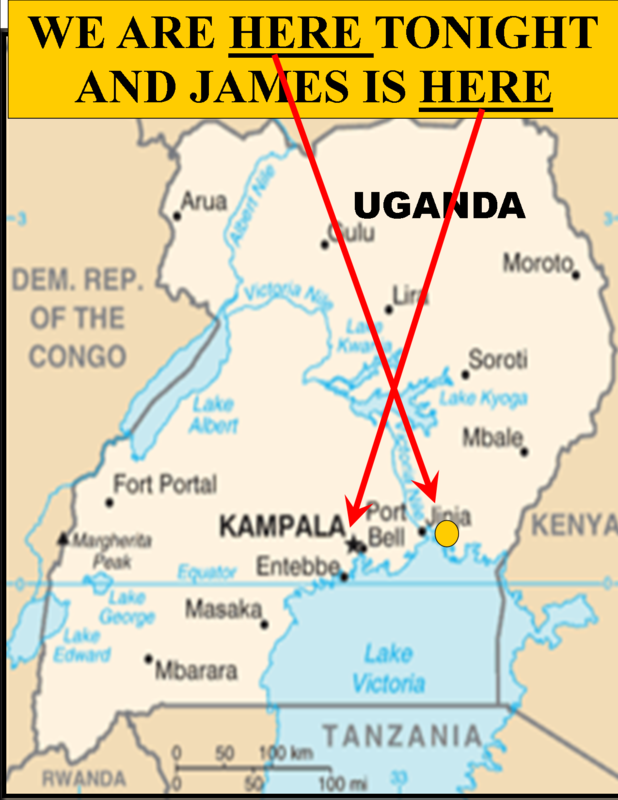 The street children in Jinja who agreed to help him could produce no meaningful leads on James in the whole time between January and February – many rumors, but no solid sightings or leads after the first few weeks. Finally, after our second week of teaching, as I related in a previous post, an organization from Kampala named Retrak suddenly showed up at Alfred’s house in Bugembe with James. We were out completing errands in Jinja, and Alfred’s phone was not working. Unable to establish any legal claim to James with only Alfred’s wife, they waited a bit for us to return, then, unable to connect with us, they left and returned to Kampala with James in tow, a journey of 2-3 hours by vehicle. Over the last week by phone, we have reconstructed as much of story as we could. 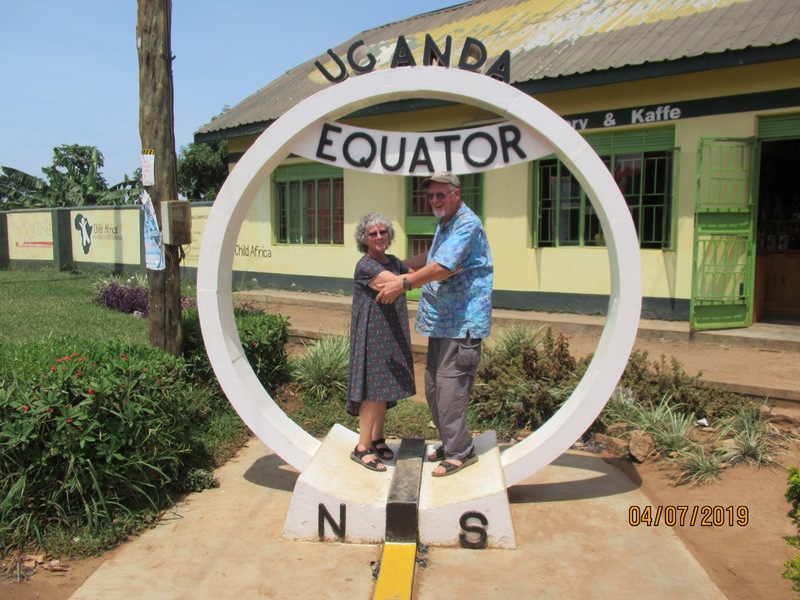 First Contact – the folks from Retrak met Gail in Mukono (suburb of Kampala) and then drove her and James to meet with us in Jinja as we returned from a teaching stint. Kampala, a walk that would have taken them five to six days unless vehicles offered them rides, which apparently often happens. We are told that this is common for these children, and James has proven it to us by his habit of constantly wandering off on adventures. When he ran from Alfred, it was clear that he had planned it because, as you know if you have read the recent posts, this was the second time he ran during this holiday, the first time to Buvuma Island and his old stomping grounds, and Alfred was attempting to watch him closely. Now I can’t imagine what it was like for James to walk to Kampala, traveling by night, sleeping rarely, we are told, with these other street children by the side of the road, and begging as they went. Kampala, of course, is a virtual Mecca for beggars, which explains the pilgrimage James made, if he understood any of it – and perhaps it was only a grand adventure with new friends. This story is from the Retrak people who returned James to us, not from James himself. I don’t know if we will ever get the whole truth of how he got to Kampala and why he went from him. He is still a very new communicator, and his language is mostly concrete words for things he uses and needs rather than abstract concepts like where, why, and how. “He is mine and I claim him…. Upon this declaration, I have proclaimed a warrant to the spiritual forces of wickedness which bind him, demanding the release of James….Trust Me in this.” This was a very unusual thing for me to hear. Something legal was being done for James in the spiritual realm – Gail and I rested on this word also by faith. There were a series of scriptures accompanying these perceptions that seemed to have the theme of return from captivity: Eze. 39:28 says, “Then they shall know that I am their God, Who sent them into captivity but also brought them back to their own land and left none of them captive any longer. And I will not hide My face from them anymore….” Yes, in context this applies to Israel. Still, this is what I wrote in my journal as I waited before the Lord, in reference to James. At the reunion after hugs. James has grown some. He is interacting with the Retrak workers with whom he has made a strong bond. James was then begging with the street children in Kampala. The police who monitor these activities noticed that James was different – he did not know how to beg like the others, but his methods were more crafty, sneaking up, grabbing and running. Of course, this is the survivor wild-child that we met on Buvuma Island five years ago, a boy who has never been taught what property is, has never had any, and who doesn’t even know the concept of stealing as a moral issue, but only that familiar existence of hunger and survival, and the seemingly pervasive African worldview of fear and power. The police arrested him around January 15. James is about13 years old now. The police do not generally handle such a child with punishment, so they immediately placed him with a charitable agency in Kampala that has a mission to return runaways to their families. This was Retrak. The very dedicated and fine people of this non-profit organization held James securely all this time since January, cared for him, and sought to trace his identity so that they could restore him to his people. In short, they became a focused advocate for him. But he was apparently only one of two deaf children they have ever worked with, and the clues to where he belonged were very few, and James was unable to lead them to his tangled roots or along his twisted path. We marvel at God’s protective grace and His specific answers to our prayers! How they came to discover he was from the Jinja area is the rest of the story… (See Part 2). One of the unexpected events of our trip across Uganda comes from the unique places we pass through. Sometimes we stop to investigate, but mostly we just slow down and snap a few pictures. 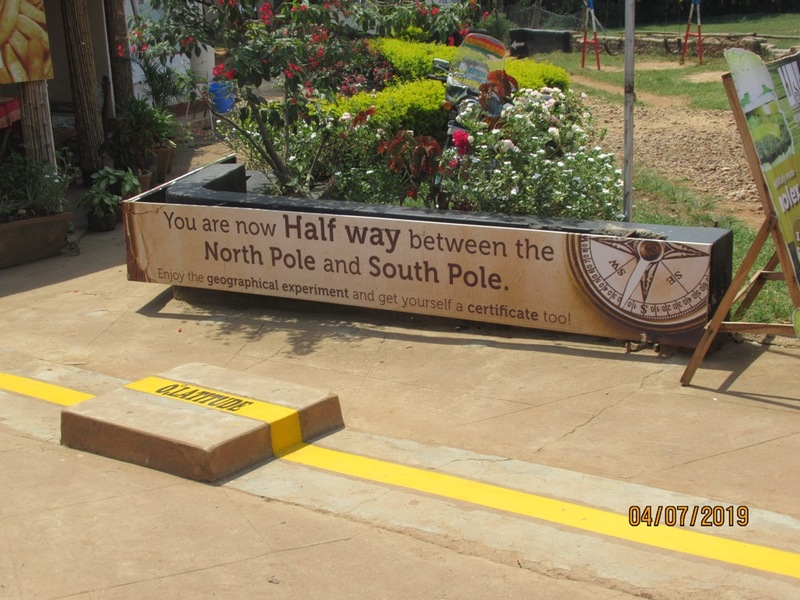 One of the places we stopped on our way to Masaka in southwestern Uganda was the small town of Kayabwe, which is the exact spot where the road crosses the equator. I often forget, living in Texas, how hot it gets in Uganda. When we arrived here a few weeks ago, we came from an undecided Texas weather pattern, typical of Texas winter, where one day is 70F and everyone is wearing shorts, and the next day it’s 42F and windy. When we passed through Amsterdam on our way to Uganda, they were still in the throes of winter, everyone wearing parkas and layers of warm clothing. 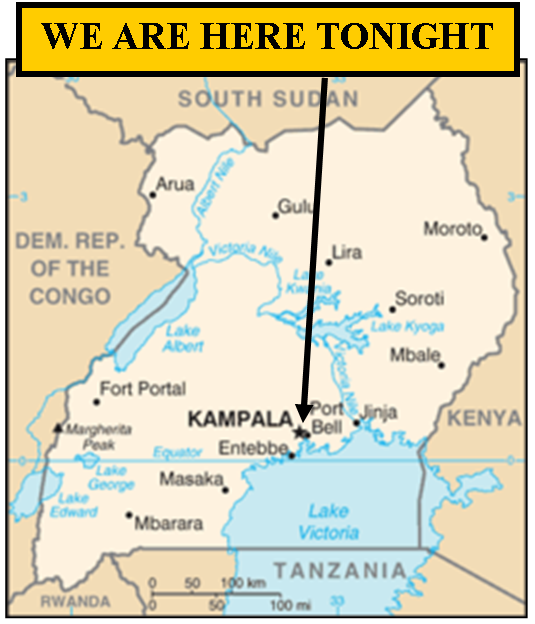 But when we arrived in Uganda, it was its normal tropical 85-95F with high humidity due to its proximity to Lake Victoria. This combines to make the ambient temperature hot, hot, hot. 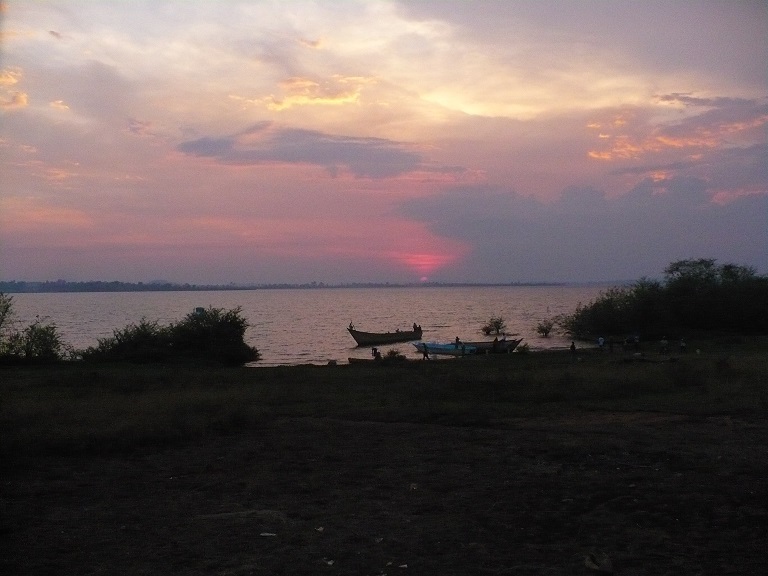 On Buvuma Island, in particular, it was so hot that to be in the guesthouse rooms was like sitting in a sauna. There is no air conditioning in such a situation, and the doors and windows must remain closed tight because it is gnat season, and the small gnats, lake flies, and mosquitoes swarm by the millions to any source of light. We arrived at our rooms almost at dark each day, so there was no opportunity to cool them off with the comfortable evening air or the breeze we get up on top of the hill where we stay. The temperature each night reminds us that we are on the equator. Though every bed in every guesthouse in Uganda sports heavy winter-quality blankets on the beds, we strip them off and rarely can even stand a single sheet over us. We don’t understand the heavy blankets, and the staff always seems confused when we hand it to them and tell them we won’t need it. Do Ugandans sleep under these thick, heavy blankets in this heat? Alfred says he doesn’t use them, so we are continually mystified by this practice. 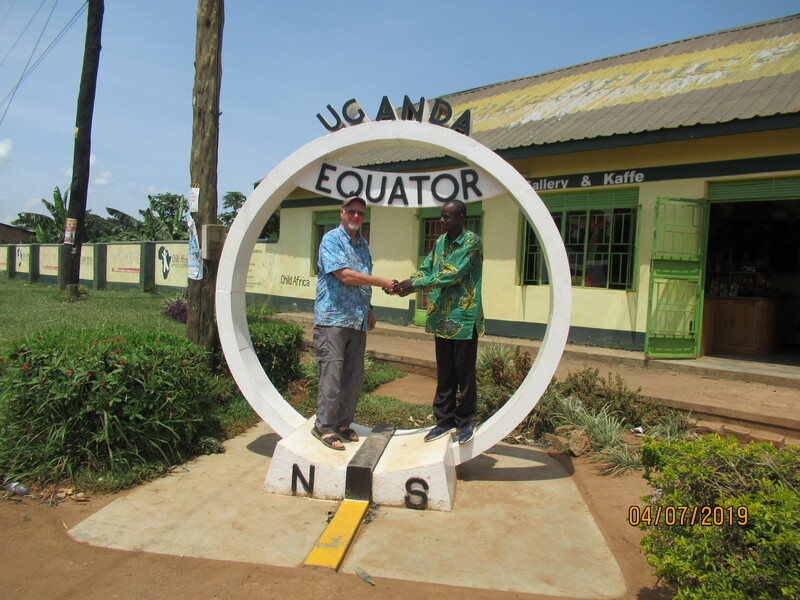 When we stopped at Kayabwe along the road south to Masaka, the locals have turned it into a tourist attraction with clearly marked “equator” signs, restaurants, and souvenir shops. 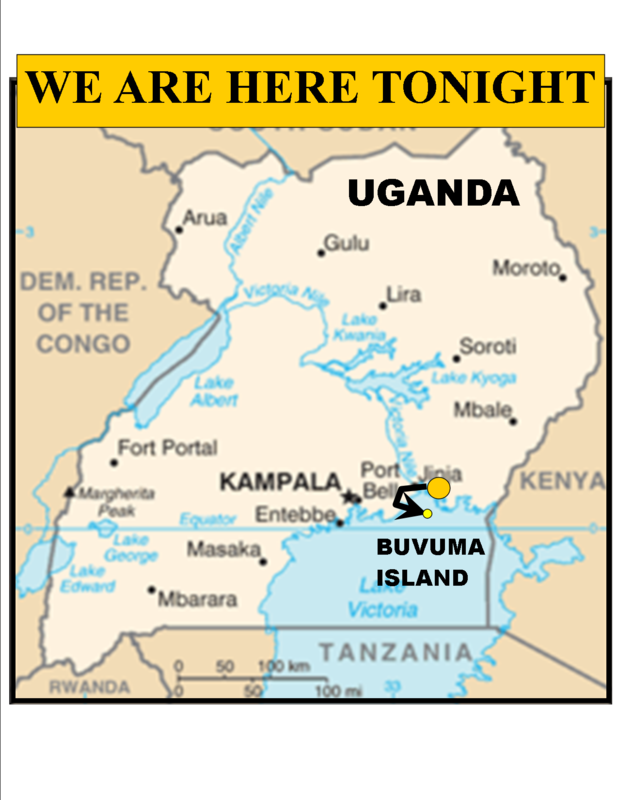 Of course, Buvuma Island is directly on the equator also, I think, but the people there are blissfully unaware of it, and there is seldom what you could call tourist traffic there. So we disembarked from the vehicle to stretch our legs, look and the exhibits and get a quick drink of something cool. The place is full of tourist buses which make their regular stops here with tourists traveling to the south and west to visit the animal parks where the authentic African animals are roaming free on the protected savannah. Near the south border with Rwanda, the famous gorilla preserve is situated, and though it is pricey to visit it, there is no lack of visitors. 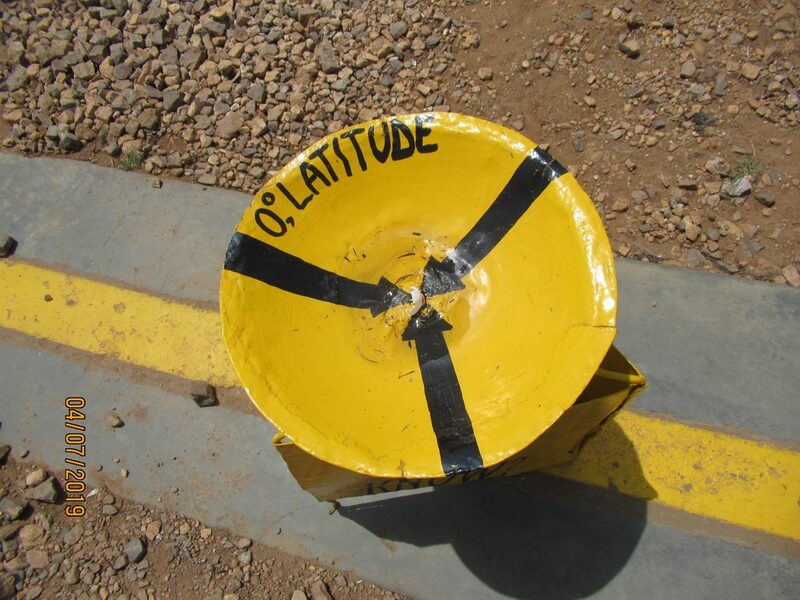 All of these people make the stop along the road at the Equator. 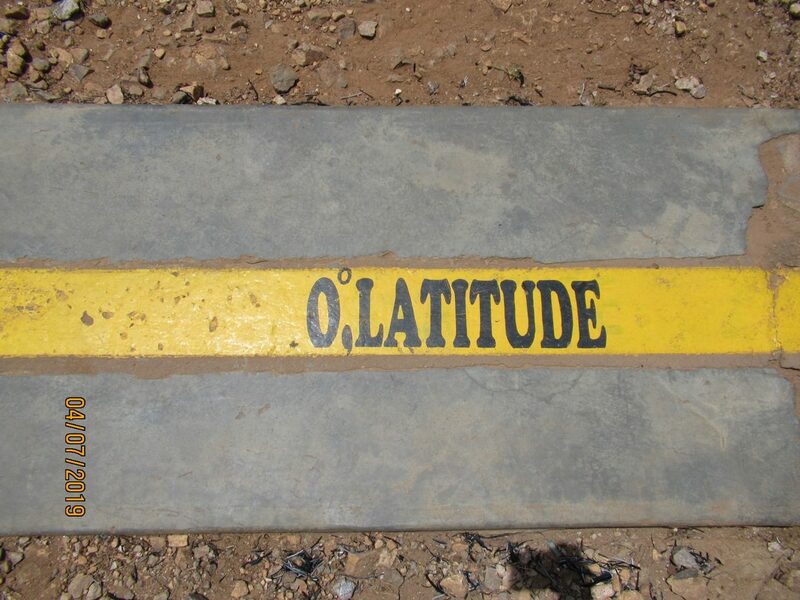 We stood on the display for pictures, shaking hands across the painted line marking the equator, one of us in the northern hemisphere and one of us in the southern. There is also a display where you can pour water on a circular pan and watch it circle the pan in the opposite direction than we are accustomed to seeing in the north. Very seldom do we take an opportunity to do touristy things in Uganda because there is so much work to be done. But this was very congruent with our schedule and route. Gail is happy finally to have this adventure checked on her bucket list. We are jumping for joy, but wondering how to get to him. We hope this is not premature, but we have just received word that James is found. We have few details as yet, but while we were out today doing errands, several members from an organization in Kampala showed up at Alfred’s house with James – apparently, he directed them to Alfred’s house. Alfred’s wife, Julie, tried to call Alfred but his phone has been malfunctioning a great deal – it is likely that at that exact moment we were either in the phone store in Jinja replacing his phone or trying to find the rumored deaf charcoal peddler who has been seen traveling with a deaf boy of about James’ description. This as yet mysterious organization couldn’t release James to Julie without some paperwork demonstrating that he actually belongs with us. Julie didn’t have the paperwork. Finally, unable to find Alfred, they returned to Kampala with James! So close, and yet so far! At this time, we are not sure who the organization is, but Alfred has been in touch with them by phone and will tell us the whole story tomorrow. Earlier this week the police picked James up in Kampala, the capital of Uganda, about three hours by car from where we are and from where James ran away. Discerning that he was a special needs child and an indigent, underage beggar, they turned him over to this organization who has been trying to trace James’ background ever since. Finally, dots were connected, police alerts confirmed as being about James, and they came to Jinja to find us. Once they got to Jinja, the little rascal actually led them straight to Alfred’s house. I’m thinking we won’t get much sleep tonight – too much dancing around the room, praying he will not have any inclination or opportunity to run away again, hoping he has had enough, and making plans to collect him at the earliest opportunity. More later as we know the facts. Our gratitude to everyone for your love and prayers. We’re not quite there yet, so please keep praying him into our hands. We had to pick up a generator in Kampala, so after a very hectic day, we arrived, completed our business, and were in a hotel by 7:30 pm. We are back on the mainland and back on the grid. This is probably the worst post I will ever have to write, though maybe “saddest” is the better term. I apologize ahead for the length. I write to inform my readers that the deaf boy, James, whom many of you have followed with great interest and generosity, has run away. I hesitated to write about it earlier until I returned to Uganda and could assess the situation directly. Now, after a year, we are back, and this is the sad, but hopefully unfinished, story of that event. On top of that, here is a boy who has had no language or meaningful teaching of any kind until the last three years in school. He has no concept of property ownership or boundaries – if he sees an open door, he walks in; if he sees something he likes, he picks it up. He is probably 13 now and has been schooled a little, has limited language with his signs, and can read some and write some. It is very difficult to determine what he understands and what he doesn’t, and, frankly, what he doesn’t choose to understand. He is intelligent, street-wise, and, well, 13 years old. Last picture we have of James. Does he understand what stealing is? We have no idea. Frequently, his discipline issues have involved thievery, which, for context, is one of the ways he survived alone for so long, though he had some relatives who vaguely “looked after” him, but unfortunately most often with the result of further caning. I’m pretty sure caning a child who does not really know why he is being caned is ineffective discipline and only causes enmity which seems to be James’ current view of his relatives whenever he sees them. Our hope was that as he gained language in a controlled school environment, he would slowly come to understand that the world is not his own personal oyster, nor are all these people his enemies to defeat with guile. I fear that we are not far enough along this track to solve the many related problems. This Christmas holiday of 2018, Alfred, our employee and partner in Meade International, offered to take James for the holiday break. Alfred and James have a strong bond and it seemed a perfect fit. During his stay with Alfred, James managed to create only a few “incidents” in the neighborhood around Alfred’s home in Bugembe. He seemed to develop relationships with the neighbor children well enough, because, as we have seen from the beginning, James is full of leadership potential, and this has been repeatedly confirmed at his school. Most of the difficulties involved either normal mischief or thievery, and Alfred and I spent a good deal of email time discussing strategies to deal with him, including finding deaf people who knew signs who could help communicate important concepts to him, like “Quit stealing, for goodness sake!” In all this time, stealing has never come up at the school teacher conferences, with us, at least, and whenever we would give James something like candy or treats, he immediately would begin sharing them among his friends – in fact, he has been the most naturally generous child I have ever met. At the end of December, James suddenly and inexplicably disappeared from Alfred’s home. Alfred, justifiably frantic, put out every form of lost child alert he could think of, including radio announcements and police reports, though generally, the people avoid involving the police here as much as possible. Nothing solid came back to him, except many false leads of deaf boys here and deaf boys there, which he spent much time tracking down only to find it was not James. Then finally, he received a call from the church leaders on Buvuma Island, out in Lake Victoria, where we first found James. James was there. One of our first pictures of James. to the island. We have no way to know how he accomplished this because of the language difficulties and because of James, himself. Alfred rented a vehicle, went to Buvuma and retrieved him, finding that he had been beaten at least once, probably for theft – James was happy to see him and ran and embraced him as if all was well. When they got back home, Alfred engaged the help of a deaf man to communicate with him, but James just smiled and laughed, and gave no explanations. He is thirteen, after all, which, considering his difficult life, is probably more like 35 in a 13 year old body. Since the second week of January, Alfred has not seen James, though he has done everything he could think of to find him. He even went into the city, Jinja, at night, a matter of ten miles or so, and formed “relationships” with the street children there, showing them James’ picture. Among those children, there were many “sightings” of James coming and going, and Alfred continued for a month going at 4:00 a.m. and other night hours to meet with the children, offer rewards for information, etc., etc. The strongest possibility in all this time is a report of a deaf charcoal peddler who travels around the region selling charcoal to households, and who has recently been seen with a deaf boy of James’ description assisting him. Unfortunately, after many attempts to find this man, Alfred only misses him by minutes every time – “he was just there a short time ago” – and we, ourselves, experienced this same dynamic with him in Jinja several times while trying to find the charcoal man. James mugging for the camera with Faith. Please pray for James and his return to us and to the school. James seemed to love the school and was always happy to return there to his many friends when we would take him out for a little adventure. So why run away? I think, but cannot prove, that he did not understand that moving to Alfred’s house was only for a holiday. There was no way to explain such an abstract idea to a boy who had never known holidays, and he has been moved and abandoned and alone so much of his life that it is impossible to know what he was thinking. Perhaps he thought school was finished for him and, after a few weeks, decided to strike out on his own as he has always done. We just don’t know. Pray against child abuse, child trafficking, and all the horrible things we are forced daily to push aside so that we can persevere in the hope of recovering him. Our hearts are broken. We write this with tears. Please, cry out to God on James behalf. Off the Grid till April 6 on Buvuma Island. 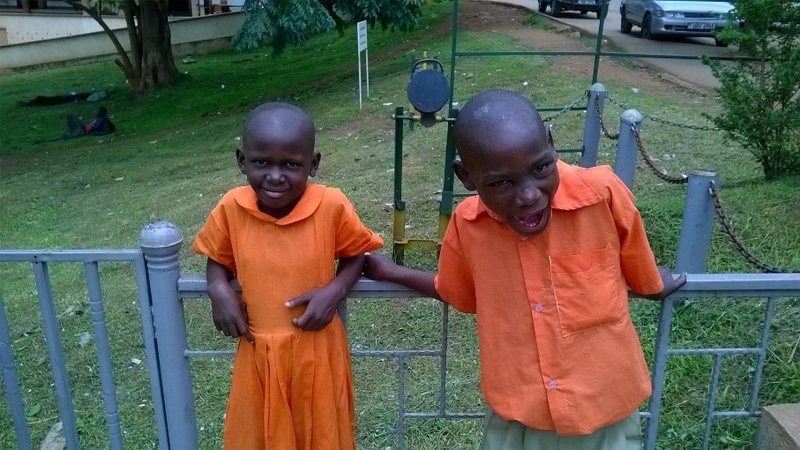 [From both Bob and Gail] – Hello from Uganda. It has been almost a year since we left here. We are so glad to be back. We are a year older and a little slower to get into the routines of adventure, but we are excitedly looking forward to these next ten weeks. Our flight here was the usual 40+ hours of mostly uneventful travel, which we largely slept through. 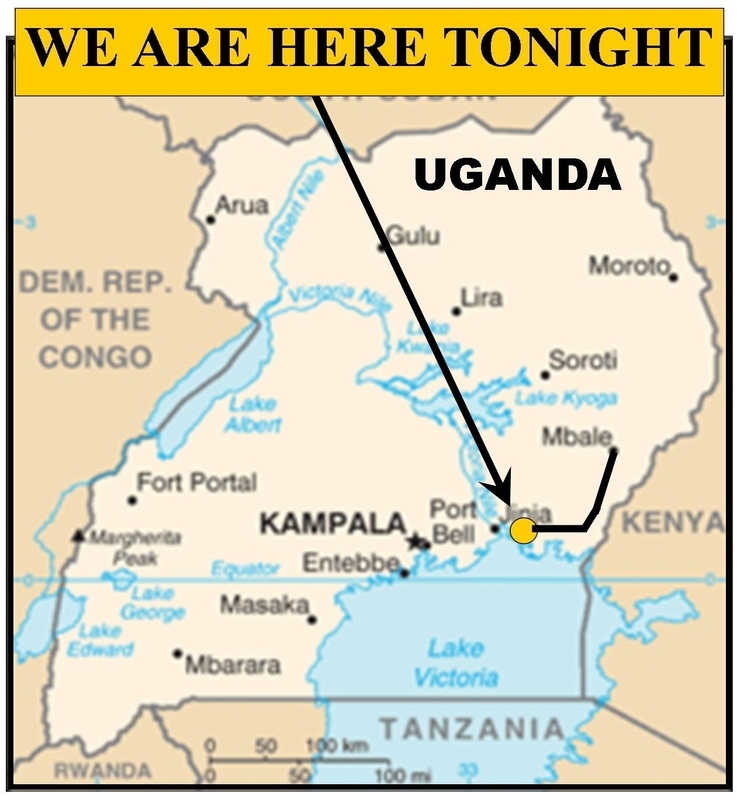 Our Ugandan assistant, Alfred, picked us up at the airport hotel on Wednesday morning, March 27, and the Ugandan odyssey began almost immediately. 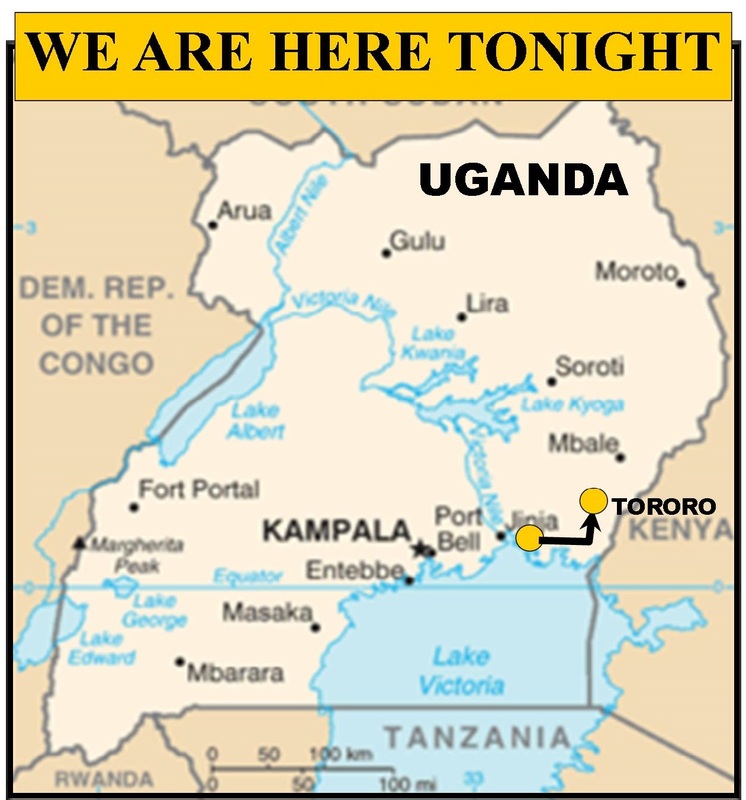 Our first stop was in Kampala, the capital of Uganda, right next to the airport – it sounds close, but it takes about three hours on a good day to get there from the airport through the dense, chaotic traffic – this is why Alfred drives and we do not. Our purpose in Kampala involved something we have always tried to avoid in Uganda assiduously – going to a bunch of government offices. We were applying for NGO status – Non-Government Organization (Non-Profit Corporation in the U.S.) – and the paperwork was in the very final stages after working diligently for three months, Alfred here in Uganda (many trips back and forth to said government offices from his home three hours away in the Jinja area), and us in the U.S. completing, editing, and emailing all the forms and documents required. During this process, Bob both learned and taught Alfred how to use Google Docs to co-write documents from 12,000 miles apart. Thank you, Evan (our son). When we arrived, we had the forms all ready for signatures. We sat in the hot car in the middle of Kampala signing the many forms to submit, and Alfred dashed off with forms in hand. We ourselves strategically continued to avoid the actual offices in order to circumvent the “musungu effect” on the overall costs. We are a bit in shock and awe that what we thought was going to be a long, laborious, and expensive process turned out to be a surprise as Alfred came back to the car with our certificate of NGO in his hands after only one additional back-and-forth to the car and fee. We are proud to announce that we are now registered and certified in Uganda as Lake Victoria Bible Institutes Limited, a charitable organization dedicated to teaching believers to plant new churches and training the leaders to lead their people. LVBI Ltd is a separate entity from Meade International, our non-profit U.S. organization. As M.I. we will continue to be the logistical and sending organ of the ministry, gathering the funding to carry out the mission, designing and preparing all the curriculum materials, and providing all the supplies that go into these mission endeavors. LVBI Ltd will include Ugandans in the leadership and training here on the ground where the actual teaching takes place in the village churches that are raised up. We hope and pray that many years after M.I. has faded from the scene, LVBI Ltd will continue its training mission. You may remember from our last trip a year ago that every day God whispered “Gulu” to us, first with the inner voice of the Spirit to both of us simultaneously as we were still at the airport and hardly conscious of where the city of Gulu even was. Then we would hear the word “Gulu” each day in news reports, see it in newspaper articles, or meet random friends of a friend who were from Gulu themselves. More than halfway through the trip, after more than five weeks of this incessant “Gulu-ing,” someone approached us at a meeting with an earnest invitation to bring our ministry to his area. What was his area, we asked. Of course, it was Gulu. We accepted the invitation and we are actually teaching a church-planting conference in the Gulu area in May. (For the details of this adventure, see “Ever Louder Whispers,” https://meadeinternational.org/2018/05/22/ever-louder-whispers/). I had to laugh when this nice stranger in the airport told me she was from Gulu. I love it when God teases me! Yes, Lord, we heard Your Voice. We are going to Gulu. Meet You there!